My dental bonding for a chipped tooth needed to be replaced. I had a new dentist who suggested I get porcelain veneers instead. He’d do four so they could match. Then, when he saw one of them had a cavity, he said I’d need crowns. So, now I have four crowns on my very front teeth and even though he said he had to do four in order for them to match, the two very front teeth look a weird grayish color. What do I do? There are so many things which went wrong here I hardly know where to start. 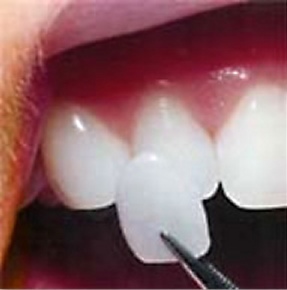 First, any dentist who says you have to do more than one crown or veneer is not a qualified cosmetic dentist. Yes, it takes skill and artistry to match a single front tooth, but isn’t that what you’re paying them for when it comes to remaking a smile—skill and artistry? Second, you can still have porcelain veneers bonded to a tooth which has a cavity as long as that cavity isn’t so large that it would require a crown under normal circumstances. That would have prevented you from having to grind down healthy tooth structure. Sadly, the only way to do this is to have the two front teeth re-done. Hopefully, he’s the type of dentist who cares about the quality of his work and will be willing to replace the crowns free of charge. However, that’s not enough. You need to make sure he’s willing to get a professional try in the paste. These are clear enough to show the color of the underlying teeth on them, giving you a clearer picture of what the crowns will look like once they’re permanently bonded. Then, he needs to let you try them in and get a good look them in several types of lighting and you’ll approve them before they’re bonded. If he’s not willing to do that, you aren’t likely to get any better results. In that case, it’s in your best interest to find an expert cosmetic dentist. Unfortunately, now that you’ve had crowns placed, you have to replace them with that forever. However, a skilled cosmetic dentist can give you gorgeous porcelain crowns. There are two places you can look to find a qualified cosmetic dentist in a reasonable distance from you. The first is at AACD.com. Do a search for an accredited cosmetic dentist. You need to check that you want them to be accredited and not just a member. There’s a difference. The second is mynewsmile.com. This site only lists artistic and skilled cosmetic dentists who can give you a beautiful smile. You’ll be safe with anyone on their list or anyone who’s been accredited.